How To Figure Out Your "Thing"
… the last month of 2017. I can officially say “winter has come” to Northern California. It’s a brisk 48 degrees and pretty windy, so it feels colder than it is (at least the sun is shining). Yesterday I went up to a little town called “Jamestown” with my entire family. 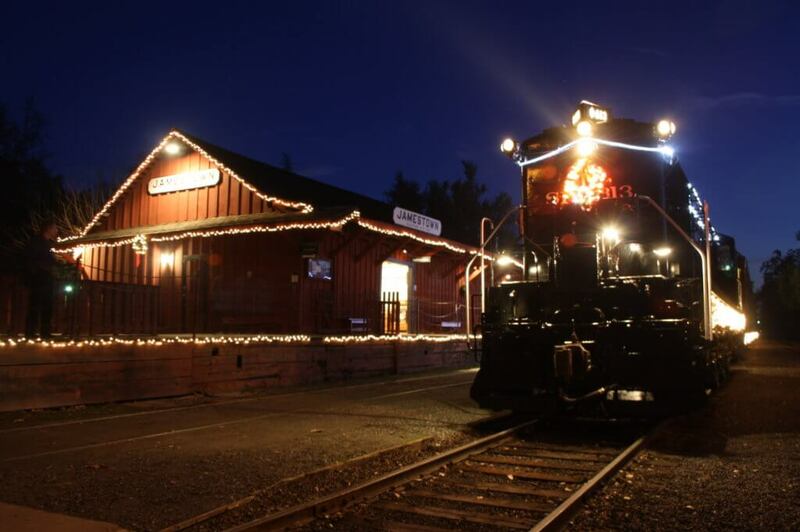 It’s an old mining town in the foothills and we rode the “Polar Express” train! We had lunch at the historic hotel, then headed up to the train. Talk about getting into the Christmas spirit! We had hot cocoa, cookies, the story was read on the train, Christmas music was sung and it was all wrapped up with a visit from Santa who handed out the Polar Express ‘bell’ to everyone on board. Being the entrepreneur that I am I started thinking about this little town that feels like it’s in the middle of nowhere and how much business the “Polar Express” train ride must bring in the last month of the year (there was another train ride after ours and they have the rest of December still…. we booked this a couple months ago and they sell out quickly). They closed the gold mine in 1994 and while they have some antique shops in town and a couple hotels and restaurants, there isn’t much else there. Up at the train station, there were a plenty of jobs that you could tell were all held by local people (lots of retirees, which was super cool). The train ride was a full-on production… conductors, the hot chocolate servers (who performed the dance in the aisles to “hot, hot, hot… hot chocolate” (if you haven’t seen the movie, this won’t make much sense), the ‘hobo’ from the movie, etc. My guess is that the town goes ALL in at this time of year. They focus on what they do really well and they put everything they have into it (apparently before the Polar Express movie came out they had a “Christmas Train Ride”, so they’ve been doing this for a while). Focusing on what you do really well and putting everything you have into it. The truth is I wasn’t sure what I did really well until I went back to basics. BUT… (no, this isn’t more preaching about the fundamentals), I think the process of continuing to try new things, whether it was plugins or a different type of service is what brought me to where I am today. It’s easy to be a generalist, which is what I did for years. The only way to find out what your ‘thing’ is is to keep trying (consistently) until something feels right. Then it’s all about more consistency and mastery. Sometimes you won’t know right away, which is why you have to give something a little more than a few tries before giving up on it. Where most people fail is they don’t get the results they wanted so instead of analyzing what they could do different they give up. I realized that my ‘thing’ had been under my nose the whole time (this is that acres of diamonds story I mentioned months ago… Google it if you’re not familiar with it). I LOVED creating content and it was where I got the best ROI. It’s just that at the time I was in the thick of client website work and couldn’t see the forest through the trees so to speak. Join me tomorrow in Content Creators where I’m going to do a live hot seat with one of the members about his content strategy! The live stream is at 10:00 am PST. You don’t have to attend live, but you do have to be a member of the group. Fun story, and great advice, Kim. Stil trying to figure out my “thing”.